Officer Seth Thayres has been a Salem police officer since 2014 and on administrative leave since October. 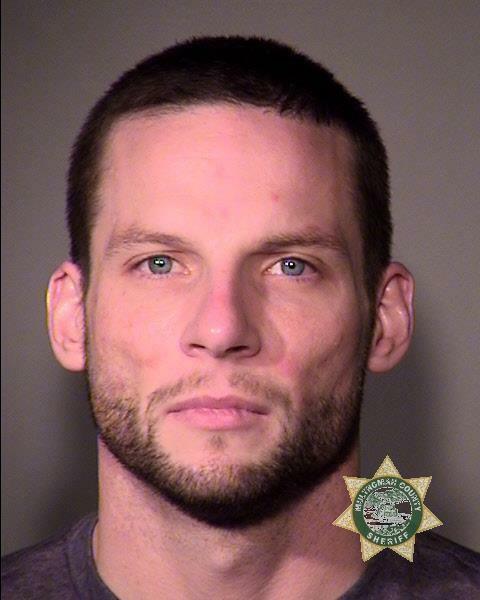 The Portland Police Bureau arrested him Wednesday and suspect he sold stolen goods from at least one recent burglary. 3:50 p.m. Feb. 7: This article was updated with more information from the Multnomah County District Attorney's Office. A Salem police officer was arrested Wednesday in Portland for meth possession and a connection to burglaries of more than $30,0000 worth of property, according to the Portland Police Bureau. Officer Seth Thayres, 31, faces two charges of first-degree theft and possession of methamphetamine. The bureau said in a statement that detectives suspected Thayres of selling stolen property from a string of burglaries. Thayres has been an officer at Salem Police Department since 2014 but hasn't worked since Oct. 9. He was a patrol officer. Salem police spokesman Lt. Treven Upkes said Thayres faced a "fitness for duty evaluation" for undisclosed reasons. Upkes said the evaluations are rare and stem from problematic behavior. Thayres is still employed by Salem police, Upkes said, pending further investigation. He continues to be paid at a rate of $37.27 per hour, according to the city of Salem. Thayres' arrest is the result of days investigating a pair of burglaries in Southeast Portland, according to the Multnomah County District Attorney's Office. Last Friday, Portland police responded to reports of a burglary in the city's Buckman neighborhood, in the 500 block of Southeast Ash Street. The district attorney's office said more than $10,000 worth of video production equipment and computers had been taken. On Monday, police learned more businesses at a nearby office building — in the 800 block of Southeast Belmont — had been struck, as well. The district attorney's office said burglars stole nearly $20,000 worth of video production equipment and computers from one business. According to the district attorney's office, one of the burglarized companies discovered on Wednesday a stolen computer had been posted for sale online and alerted police. Detectives then arranged to meet the seller. During that meeting, court records show the seller told detectives he bought the computers from "The Mac Men" at the Pony Soldier Inn, a Northeast Portland hotel. Thayres and another man, 35-year-old James Cardenas, were arrested around midnight in the hotel lobby, according to court records. With the two in custody, officers said they saw in Thayres' wallet a Salem Police Department ID. When asked if he was a police officer, Thayres responded he was, according to court records. Court records show police found more high-end computers, cameras and electronics in the pair's hotel room as well as "a small pile of fine methamphetamine with small line residue lines as if someone was making lines to snort," the documents said. Police also said they found a meth pipe and syringes. Thayres reportedly denied using drugs when asked by the arresting officers and said he would pass a urine test. Later he declined to provide a urine sample, the police said. Thayres and Cardenas were both taken to Multnomah County Detention Center. The criminal charges are Thayres' first in Oregon, according to court records.